The two windows to the right of the double door entrance belonged to the office of Mr. Wilfred Dawes - the boy's Headmaster. These doors were 'out of bounds' to pupils. Mr. Fred Tinkler from Newton had the adjacent classroom with the 4 windows, and he was not only the teacher of Form 4A, but also the Boy's Art Master. This photo shows two classrooms of the boy's side of the school, followed by the boy's teacher's Rest Room and the boys school entrance straight ahead. On 13th February 1939, Mr Wilfred Dawes, at the age of 29, took over duty as Headmaster. He retired in 1974 (after 35 years in the post). On 16th March 1939, The School (originally named Alfreton Central Elementary School) was formerly opened in the afternoon by Alderman W. Mortimer Wilson, M.A., and the number of pupils totalled 360 boys and girls. Then, on 4th September 1939, the headmaster met the staff at school at 9am and it was decided that the schools were to close forthwith until further notice on account of the declaration of war with Germany. On 9th October 1939, the schools were re-opened for full time instruction. The first air-raid practices took place on 13th May 1940, using the newly built air-raid shelters. The whole school was safely accommodated in the shelters in just one and half minutes. On 4th November 1940, the first daylight air-raid warning was sounded at 10:25am and all the pupils were in the shelters by 10:28am, this time it took 3 minutes. In 1944, The school became known as the 'Alfreton Secondary Modern School'. But 22nd July 1966 saw the last day of the school as a Modern Secondary School. 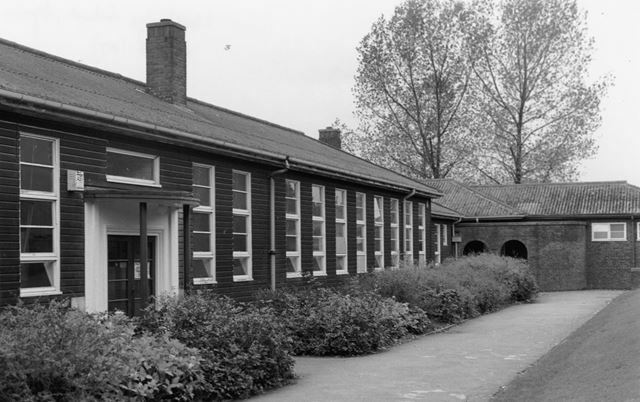 In September 1966, the school re-opened in the new term as a Comprehensive School. Shortly after the Second World War was over, it was decided to have four in-school competing 'houses', namely:- 'Brindley'; 'Nightingale'; 'Royce' and 'Stephenson'.